Leigh Community Art Group: A Great Way To Start The New Year! Discover something you may have lost since childhood - the pleasure of drawing and painting. Have the chance to make beautiful , unique presents for your family and friends. If so, we may well be what you have been looking for. Lots of people I meet say they like/ used to do painting/ drawing etc. They are convinced they can't for some reason or other. happily that is not true. It is a proven fact that anyone who can follow a recipe or drive a car etc can paint or draw. They just don't believe it. I know people are also put off by a fear of not being self conscious and / or good enough. We don't have any competition in our club. Beginners can do their own thing or ask for any help they may need which will be given readily with pleasure. No one will judge you. The monthly shows we have are certainly not mandatory and there will never be any pressure to take part in them. However if you do wish to exhibit there is no qualifying period of membership. All we ask is that you do your share of supporting the club by regular attendance when you are able. Our costs are small and there is no need to bring anything to start. we will provide what you need for your first couple of classes until you know whether you want to stay.Your only costs will be £2.50 per night to cover room rental plus coffee/tea and biscuits. If you already have some art materials then feel free to bring them along. We look forward to seeing you on or after Monday 13th January. 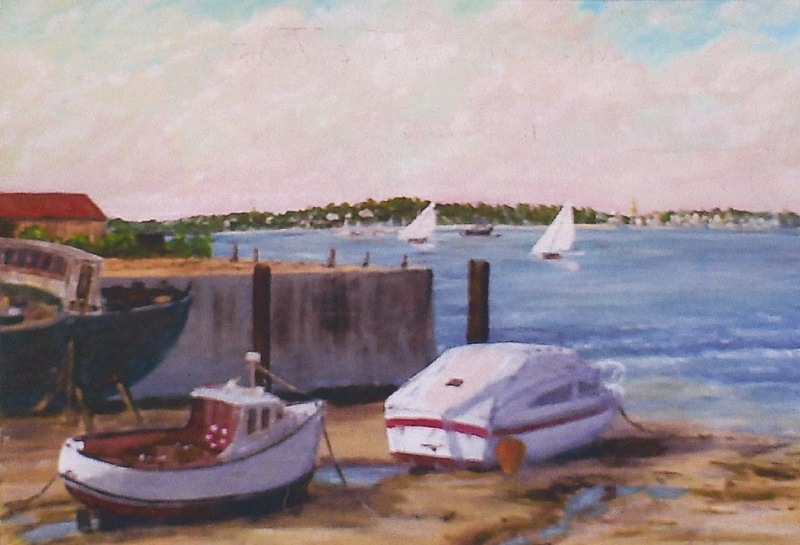 "Waiting For The Tide", acrylic by B. Gill, one of our club members.